The thyroid is a gland located in the neck. It is a part of the endocrine (hormone) system, and plays a major role in regulating the body's metabolism. 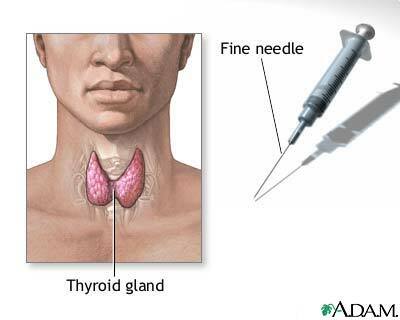 If a sample of cells is needed from the thyroid gland a fine needle biopsy can be performed. During this procedure, a skinny needle is inserted into the thyroid gland, and a sample of thyroid cells and fluid is drawn into the needle. The needle is then withdrawn and the cells are sent for examination. This test is usually performed to diagnose thyroid disease or thyroid cancer.